Have you always wanted to go to Green Island? Did you know there are some fantastic coral reefs just walking distance off the coast of Mackay? Mackay Conservation Group is inviting you to join us on Sunday 30 March for a walk to Green Island at low tide. On the way we'll be able to see excellent examples of soft and hard corals. Meet us at the Shoal Point play park at 12 noon. Bring along walking shoes suitable for water, drinking water, hat, sun screen and camera. This is part of our Beautiful Walks series, encouraging appreciation of Mackay's beautiful natural environment. For more information call the Mackay Conservation Group office on 4953 0808. It's going to be a big year for the campaign to save the Great Barrier Reef from coal ports. This Thursday we're inviting all new and existing volunteers to a campaign information night and strategy session. As you know, the Great Barrier Reef Marine Park Authority approved the dumping of dredge spoil at Abbot Point and there has been outrage expressed across the country. There are events in Melbourne, Sydney, Adelaide and Perth today about the decision. The campaign for the Reef has gone national and as people who live alongside the GBR our voice is crucial. Below is a photograph from our event outside the GBRMPA office on January 24th. We did have this meeting planned for 30 January, but then were struck by Cyclone Dylan! The outcome of the meeting will be activities and actions for the next few months! For more information contact Ellen on 0408 583 694 or Gemma on 0423 044 431. The next MCG Environmental Education series will be Friday Feb 28th at the Cook Theatre CQU Mackay campus from 6-8pm. Free but RSVP to Ros Lowry at 4953 0808 or email mcgmail@bigpond.com for catering purposes. Three short films will be shown. Two are from Lock the Gate and one is from the Environmental health sector. The two Lock the Gate films are directed by two Northern Rivers film makers, who have volunteered most of their time. Please attend and make a donation to help us protect communities at risk. 35 min Undermining Australia. Personal stories of Australian whose lives have been changed forever by coal mining. 35 min Fractured Country About the risks to communities from invasive gasfields. of the massive expansion on coal and gas in Australia. Australia (PHAA). PHAA is the principal non-government organisation for public health in Australia. The presentation for all three speakers from the evening is available here. Profile the Great Barrier Reef! Here's a great graphic for your Facebook profile! Make sure you change it before GBRMPA makes it's decision on January 31st. 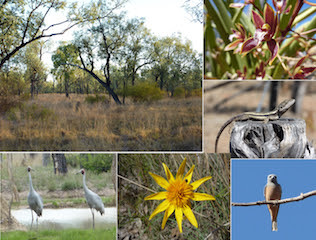 Federal Environment Minister Greg Hunt is due to make a decision on the massive coal mine that would destroy Bimblebox Nature Refuge by this Friday, the 20th December. We urge all Bimblebox supporters to call Greg Hunt's office or drop him an email this week, to let him know that there is a big number of Australians out there who don’t want to see this mine to go ahead. Tell Minister Hunt: "Save Bimblebox from coal mining!" Click read more for key points you might to mention.